Four Scappoose Indians have been voted to the all-Cowapa League baseball first team. Two other team members made honorable mention. Gross and Toman also have been chosen to play in the North-South All-Star series at Roseburg on June 16-17. 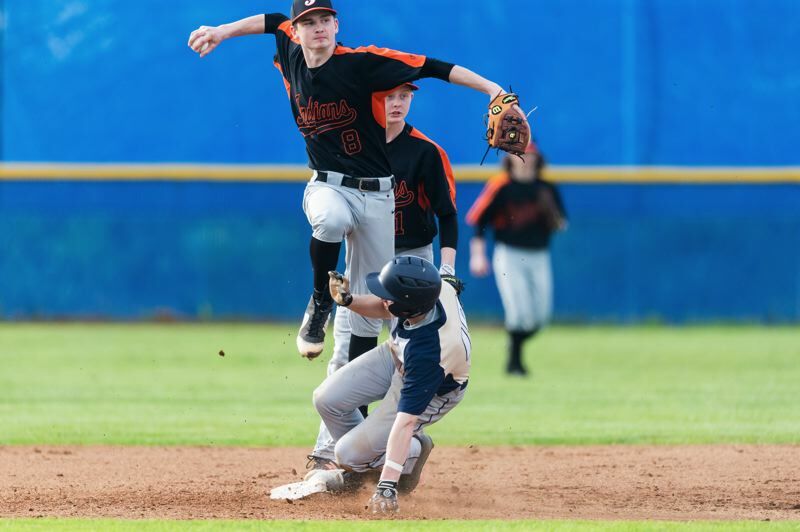 For Scappoose this season, Gross had what coach Mike Reed calls "Little League numbers" — a .517 batting average, 49 hits, 36 RBIs, nine doubles, three triples and one home run. "His numbers were off the board," Reed said. Gross hit safely in 25 of 26 games and ended the year with a 15-game hitting streak. Reed says that was due to old-fashioned hard work. "He was the first guy to our optional winter workouts every day, and he did not miss a one of them," Reed said. "He became a great player because of it." Gross plans to play next season for George Fox University in Newberg. "Their assistant coach came and watched us, and JC hit two balls off the fence," Reed said. "Then the head coach came and watched us." Gross also was in the Indians' rotation of starting pitchers and went 5-5 with a 3.50 ERA — numbers skewed by a couple of tough losses to co-league champion Banks. "He's had two good years on the mound," Reed said, "and does a good job defensively. He got better at that this year, his errors were way down. He's a steady player." Reed says the 6-foot-1 Gross may wind up playing second base for George Fox, a member of the NCAA Division III Northwest Conference. "He's got a great arm, and offensively, he can definitely play at the next level," Reed said. So can Toman, who has signed as a quarterback with Portland State. In baseball this spring for Scappoose, Toman played every position except first base and catcher. He scored 43 runs and stole 17 basis. "The fastest kid I've ever had," Reed said. "Usually when he got on first base we were going to score a run." Toman could "definitely play college baseball at the next level, but he wants to play football," Reed added. Toman's baseball versatility came in handy this year, especially with an injury to catcher Gill that forced some infield shuffling. Toman also was 2-0 in a closer role this spring. Mann emerged this year as a dependable starting pitcher. "This kid came out of nowhere," Reed said. "He played mostly JV ball last year and hit maybe .250 last summer with wood bats. "But he came in during the winter and threw the ball pretty well in optional workouts. He was basically slated to be a middle reliever this year, but ended up pitching at the front of our rotation, and we had three very good pitchers. "He's the poster child for what can happen when you work hard and want to play the game." Mann began to really serve notice when he pitched three perfect innings in a team no-hitter and win at Rainier early in the season. He had another no-run appearance, and a little later, he got the win when the Class 4A Indians knocked off 5A Central. "He made them look silly," Reed said. Mann, who also batted .550, had a 1.30 ERA with high strikeout numbers, including 13 in a game against Valley Catholic and 10 in one outing versus Seaside. "He's got three pitches he can throw for a strike at any time," Reed said. Travis was a key returning pitcher for the Indians in 2018. His highlights included a 7-2 victory in a must-win game at Seaside and a key late-season triumph on the mound against Valley Catholic, 3-1. "That Valley Catholic game was as good as I've seen him pitch in two years," Reed said. "He throws very hard, but usually has good control. He just works on getting ahead of guys and then finishing them off." Catcher Gill suffered a torn labrum and wasn't able to finish the year behind the plate, but he continued to play as a designated hitter. "He still hit .320 for us, even though he couldn't get the ball up in the air because of his injury," Reed said. "A great kid — was first-team all-league last year." Witt was the Indians' third baseman until the injury to Gill. "Carson had to go back and catch for us, something he hadn't done since he was a sophomore, and he was outstanding," Reed said. Witt led Scappoose in home runs with three. He also won the Coaches Award "for his attitude and desire to play baseball," Reed noted. Scappoose finished the year ranked 12th in 4A by the Oregon School Activities Association. The Indians were third in the Cowapa at 9-6, two games behind Astoria and Banks. Overall, Scappoose wound up with a 15-12 record, losing a tough one in the Play-In round, 5-4 to Estacada. The Indians are looking for a new coach now, too, with Reed having stepped down last week. He is moving to San Diego with his wife, who is starting a new job there in the nursing industry.